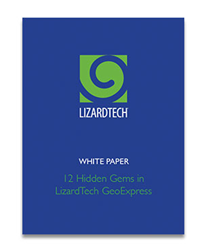 LizardTech®, a provider of software solutions for managing and distributing geospatial content, has published a white paper showing users how to access 12 little-known geospatial data manipulation tools inside its popular GeoExpress® software. The white paper is free to download here. GeoExpress offers a dozen built-in applications that users can leverage to further process and enhance their geospatial data sets. LizardTech developed these tools to improve end user efficiency when working with raster satellite and aerial imagery and LiDAR elevation data. Mosaicking is one of the most powerful functions found in GeoExpress. It enables users to digitally stitch together multiple raster images or LiDAR data into seamless, geographically continuous mosaics. The number of individual scenes that can be mosaicked is limited only by computer capacity. For raster images, once the mosaic is complete, users can apply a variety of Color Balance tools to eliminate contrasts among scenes and create a visually consistent image. The other hidden gems allow GeoExpress users to Crop and Reproject data on the fly, Despeckle compressed images, and Edit Metadata in header files. In addition, GeoExpress offers a wide variety of options for Exporting files, creating Multispectral Color Composites, and Watermarking images. Newly added in mid-2015, compression tools perform LiDAR Conversion to a variety of popular file formats. Read about all 12 Hidden Gems in GeoExpress by clicking here. Since 1992, LizardTech has delivered state-of-the-art software products for managing and distributing massive, high-resolution geospatial data such as aerial and satellite imagery and LiDAR data. LizardTech pioneered the MrSID technology, a powerful wavelet-based image encoder, viewer and file format. LizardTech has offices in Seattle, Denver, London and Tokyo. For more information about LizardTech, visit http://www.lizardtech.com.